With the CFX, Yamaha now moves to the center of the stage. The nine-foot CFX is a full size concert grand piano characterized by a powerful bass, a wide palette of tonal colors, and the ability to create the subtlest musical expression. The sound is rich yet clear in all registers, and can be heard over the sound of a symphony orchestra, even in very large concert halls. The CFX is Yamaha’s flagship model, and it marks a new milestone in the history of fine piano manufacturing. The CF Series features three models that will delight and possibly even surprise you with their power, tonal richness, dynamic range and colour. And at the same time the keyboard and its action are a absolute pleasure to use offering impeccable control that encourages the performer to reach new levels of musical expression. These handcrafted instruments are backed by over a hundred years of high calibre concert piano production, with extensive research analyzing what makes a truly great piano. Yamaha experts have spent many many hours together with top world-class performers testing, evaluating and evolving the pianos into the instruments they are today--pianos that are capable of gracing any stage in the world. In the making of pianos the choice of materials is a much-considered subject. For Yamaha, the concept of perfection starts by setting the selection criteria on which all its materials are chosen. For Premium Pianos only the world’s finest materials are used. They are then crafted into each and every component – always with the consideration that it is the blend and harmony of each element that ensures the pedigree of the end result. Wood that has been specially selected based on the grain structure, strength and resonance is seasoned for long periods so that it is perfect to form the ribs, soundboard and bridges. Hi-grade felt for the hammers, the leather used in the mechanism of the action, which is itself engineered to the highest precision levels, or the cast-iron plate that is produced at Yamaha’s own foundry: it is the interaction and synergy among all these materials which turns an instrument into a Yamaha Premium Piano. This dedication is applied to every individual stage of production and the most rigid quality controls possible ensure that each instrument attains the desired quality level. It is the fusion of all the elements that is critical – every component, each material, the method of assembly and the quality checks that create the final product. 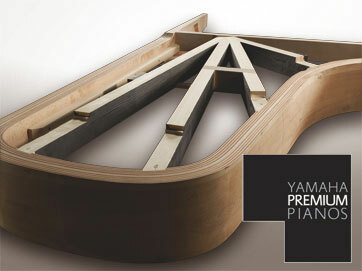 Add to this the experience of the master builder, the demands of the artist and the technological expertise available from a long tradition of craftsmanship, and then it is clear to see how Yamaha succeeds in creating what pianists experience as the form of perfect harmony between performer and piano.